Combine flours in a large bowl. Measure water and add leaven. Squish through with fingers until there are no more lumps. Make a well in the flour and pour leaven mixture into the well and slowly begin to incorporate by squishing the flour into the liquid. Do not incorporate any more of the flour from the sides until the mixture is well blended. Slowly pull in more flour from the sides of the well and continue mixing and squishing through your fingers until the mixture is one homogenous mass. Scrape down the sides and beneath until there are no remaining bits of flour. Clean the dough off your fingers and using just enough olive oil to keep it from stocking, scrape sides and bottom. Cover and let rest 10 minutes. Dimple dough and sprinkle with salt. Flip over. Do knead number one, no more than 30 kneads to the center. Flip back over, place in a warm spot and allow to rest for 10 minutes. Loosen dough with scraper before flipping for knead number two. Flip back over and leave 10 minutes. Loosen dough with scraper, flip, knead for the third time and flip back over and leave for a half hour. 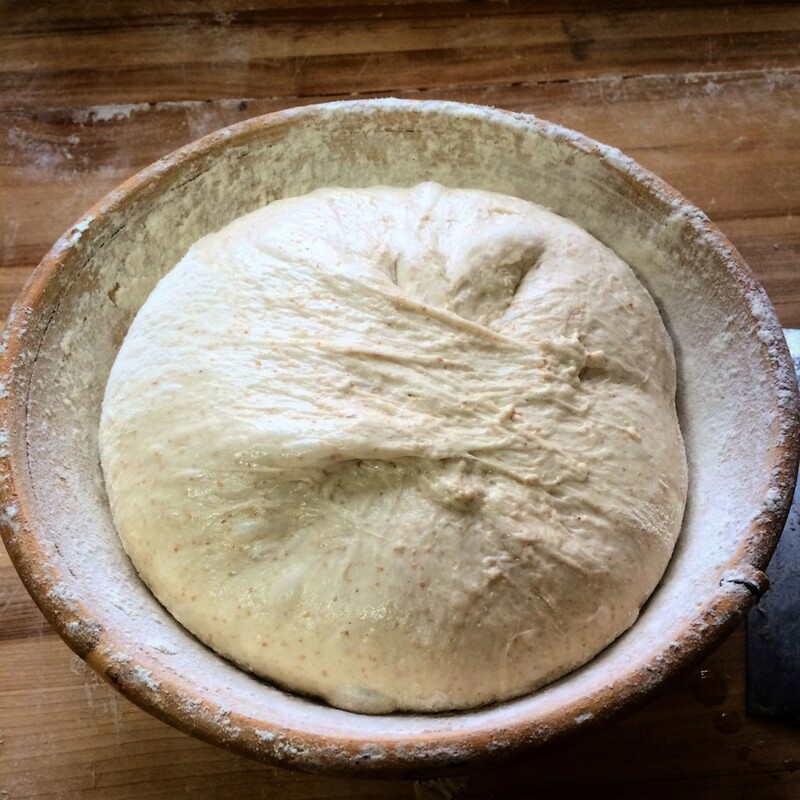 To do a fold, wet hands and gently but deftly loosen dough from beneath and pull up to stretch about six inches high and fold the dough over on itself. Rotate bowl and do this twice more. Rest 30 minutes. Continue to fold every half hour for three more times. Divide into half and form into loaves by folding the dough in on itself on the top two corners and rolling it towards you. Continue to roll towards you, putting tension on the dough to form a crust. Let rest for 15 minutes. Place upside down in a floured loaf pan and cover with a plastic bag. Put in the refrigerator overnight. When ready to fire, place a seasoned dutch oven with lid in the oven and preheat to 500 degrees. Remove from oven and quickly, but carefully, turn the loaf pan over to release the bread into the dutch oven. Using a sharp knife or razor, slice the loaf quickly on a 45 degree angle in an arc. Quickly cover and place in oven. Reduce heat to 450 and bake for 20 minutes. Remove lid and bake for another 20 minutes or until the bottom of the bread sounds hollow when you tap it. Let cool. Slice and enjoy.